Drake casino is a captivating instant play online casino that utilizes cutting-edge technology in their gameplay with generous bonuses, promotions, and excellent customer support team. The casino site is accessible on leading mobile devices including Android, Windows, Blackberry, and iOS. The casino was established in 2012 and it is currently under the management of Drake Casinos Ltd. You will be thrilled by their amazing game portfolio with popular titles like blackjack, roulette, baccarat and video slots. Furthermore, there are safe and secure banking options where gamers enjoy first cashouts among other benefits. Drake casino is in partnership with one of the industry’s best developers who is known for crafting immersive video slots with multiple winning features. The betsoft game library is available in instant play, meaning players don’t need to download any software to access games. There are also multiple games from Arrow’s Edge software developers. The casino site can be accessed on a good number of mobile devices such as Android, iOS, Blackberry, and Windows. Mobile gamers can access the game lobby instantly via mobile and desktop browsers like Microsoft Edge, Opera, Firefox, and Chrome. Online Slots: Dodge City Slots, License to Spin, 7th Heaven, After Night Falls, Blood Eternal, World Leaders, All Night in Paris, Arcade Fortune, and Alkemo’s Tower. Video Poker: 5 Hand Deuces Wild, Bonus Poker, Jacks or Better, Double Bonus Poker, Deuces Wild and Joker Poker. Specialty Games: Instant Keno, Krazy Keno, Traditional Keno, Skratcherz, and Club Keno. In addition, Drake casino has jackpot games divided into super jackpot slots, mystery jackpot slots, and cash grab jackpot slots. All players who sign up at Drake casino are entitled to a welcome bonus up to 540 free spins and 300% up to $6000. There are promotional offers like weekly bonuses, Monday spins, and Drake Club. 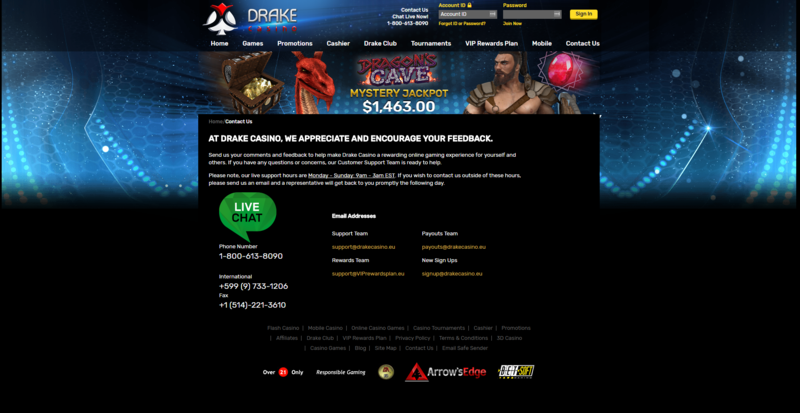 Drake casino employs the safest 128-bit SSL data encryption software to protect player information. They use TST in testing and certifying their games to ensure that they are fair. Additionally, the games are backed with RNG which ensures games have fair and random results. The casino holds a license from the governing authority of Curacao e-Gaming. Every player’s feedback is highly appreciated at Drake Casino. If you have any questions or other concerns, you can access the agents via live chat (Monday-Sunday: 9 am – 3 am EST), phone and email.